A cross between tennis, ping pong and badminton; this game is played with a solid paddle and a whiffle ball. The game is played most often in a doubles format. The net is lower than tennis and the court is also smaller, so minimal running is required. Pickleball delivers a fun experience for both social and competitive players! 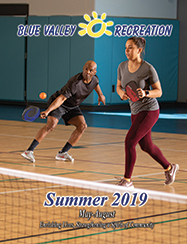 Compete in our second BVRC pickleball tournament at the BVRC Rec Center at Hilltop. Space is limited. ***In order to register, please call 913-685-6090, stop by the front desk at the BVRC Rec Center at Hilltop (7720 W 143rd St) or register online with code # 176024.